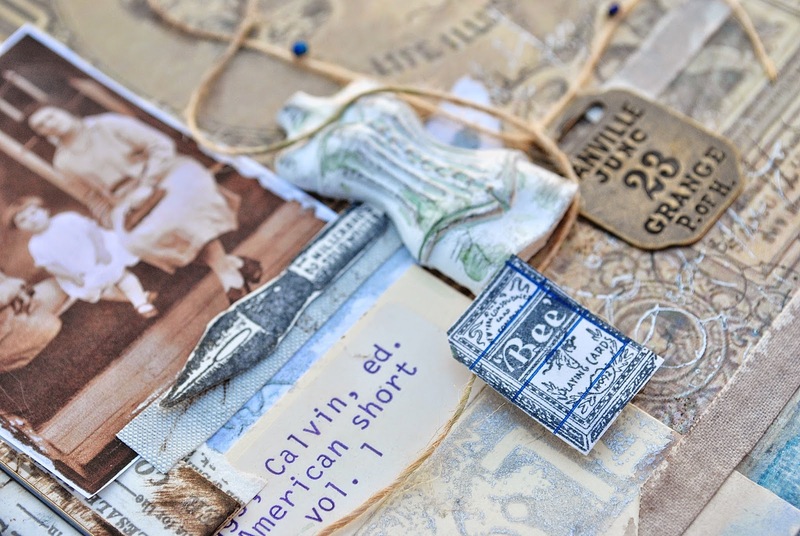 Stamping and fashion portrait - are they friends? Hi) It's Maria Potapovich here today for you. It so full of a variety of means of expression, but this time I wanted to add some stamps! Here's the first one - it's just an illustration in itself. 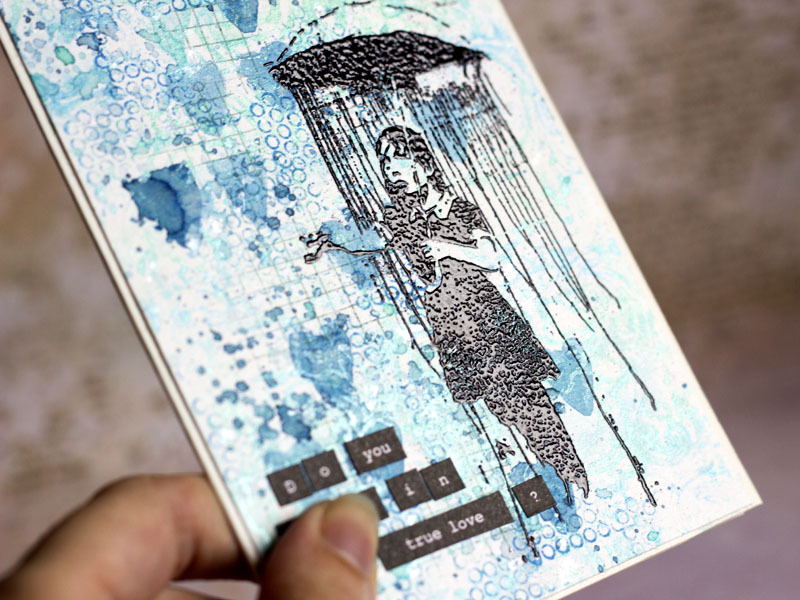 What do you think: can illustration and stamping be the friends? Do they help or hinder each other? Thank you for your attention and... have a creative day! Recently I've been joining in on a few ATC swaps. It helps me hone some of my skills to work on a small space. Today I've got two ATCs to share. The first is a Harvest Moon ATC. I started by coloring some watercolor paper with Clearsnap Smooch Spritz. 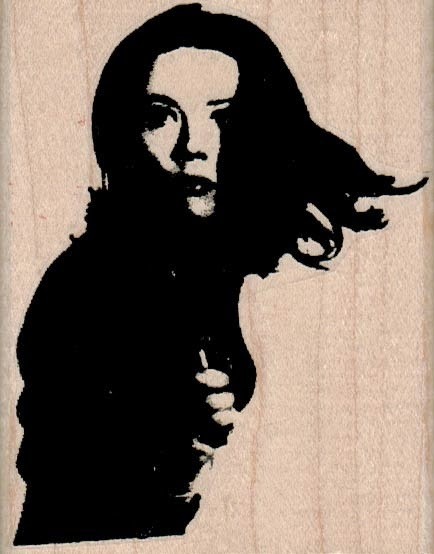 After it had dried completely I spritzed a StencilGirl stencil with the same spritz an dstamped in the top left corner. My harvest moon is the Full Moon 2 3/4 x 1 3/4 in archival black ink. 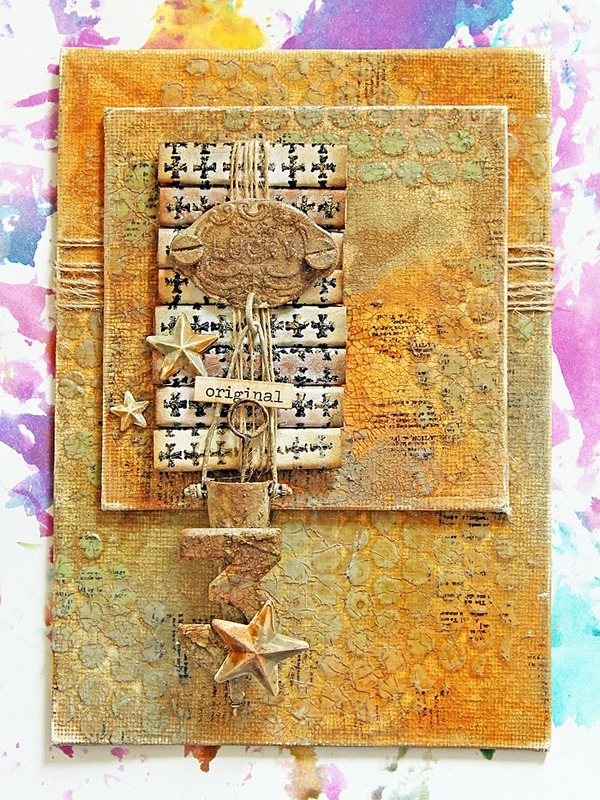 I finished off the ATC with chipboard bats, some ribbon, and a hand drawn border. The second ATC was button themed. The base for this card is watercolor paper as well. 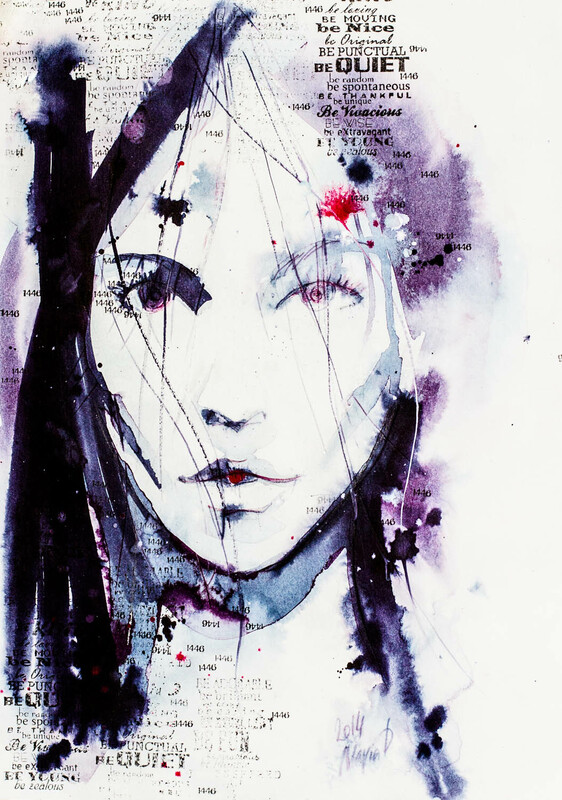 It has been distressed with Distress Ink and water. I stamped the Weathered Tree in Archival ink black and Be True in Versafine smoky gray. The leaf has been covered in gesso and layered with a metal flower, Amazing Crafting Products resin, Clearsnap glitter, May Arts Ribbon and UmWowStudio chipboard buttons. 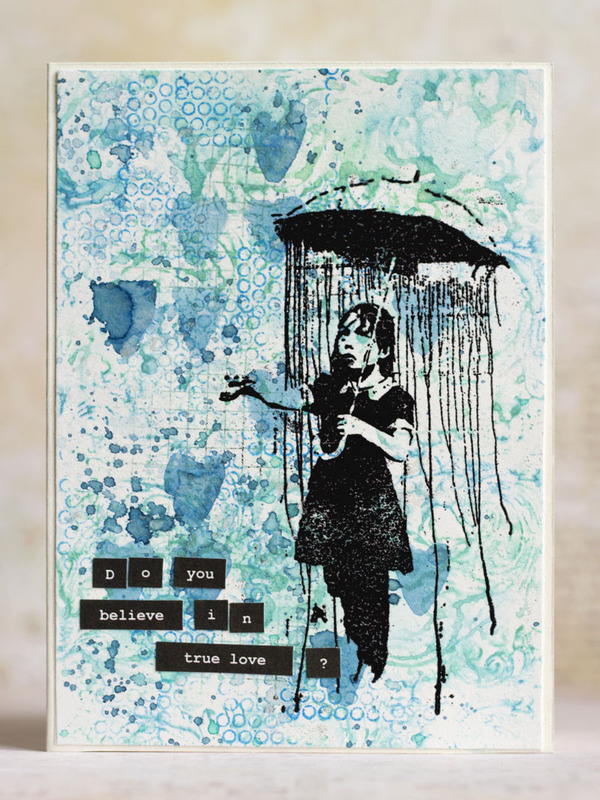 Today I'll show you my new card with Banksy stamps, just adore them! It's me Tera here again with another super fun tutorial!! Today I want to share something that would be great as Halloween props, or for general decoration if you have a cabinet of curiosity's like I do! This is still in keeping with the creepy medical theme I have had the last few projects, as you can tell I LOVE this theme!!! Now (making sure that your paper/cardstock is completely dry) start stamping your numbers for your "Labels" In various colors to decide what you like the best, This is the fun Part!!! Thank you all in advance for your comments! Hope you enjoyed this fun adventure!!! Alot of the stamps are just the right size for either ATC's or for the pocket cards. I hope you enjoyed seeing how I used these stamps and until next time! 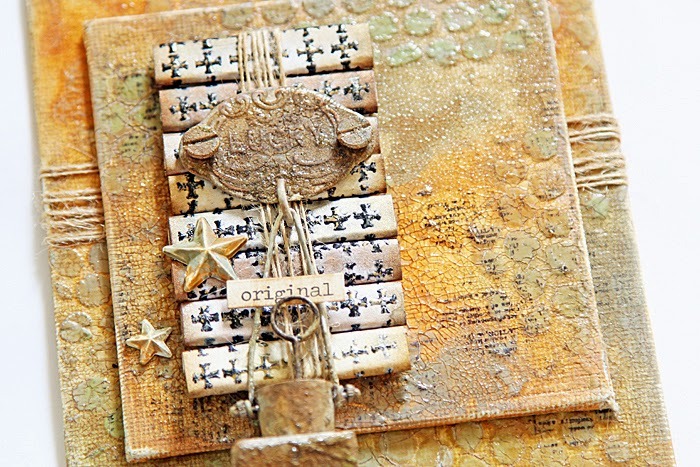 Tina here today with a dimensional Mini Canvas project that is FULL of texture created by using Stamps and Stencils - two of my favorite tools! 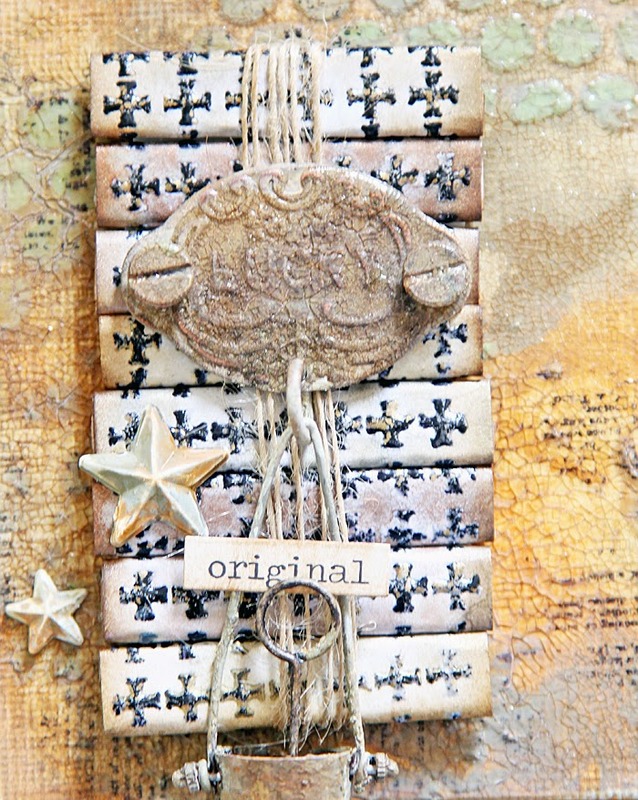 If you only had a couple of favorite stamps and a stencil or two, you could create an unlimited number of unique canvases! The possibilities are endless. 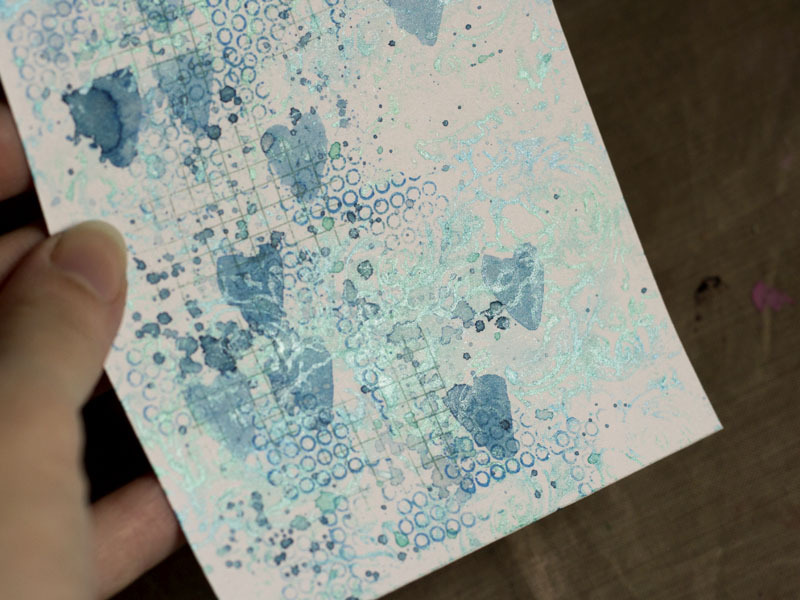 To create my background texture, I applied Shimmerz Dazzelerz through a Crafters Workshop stencil and let dry completely. 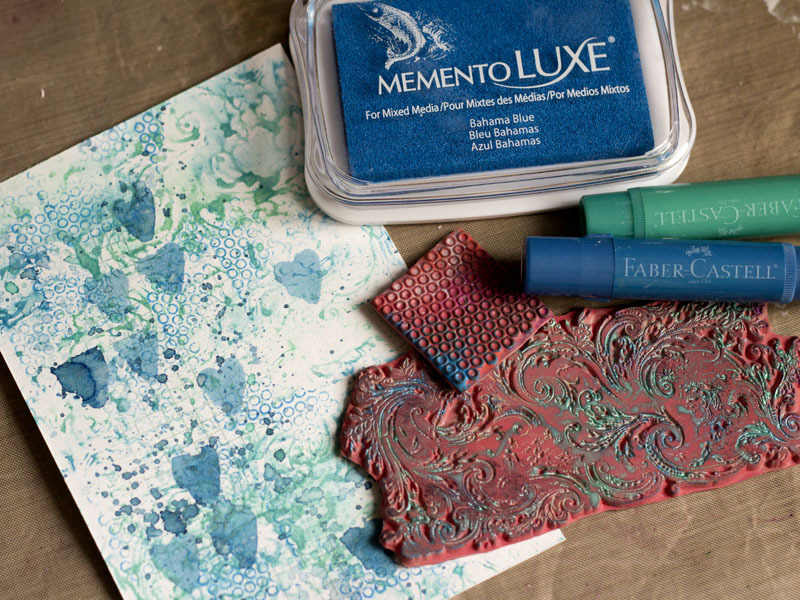 I then applied several shades of Distress Paint (over the stenciled pattern) and let the colors mix and blend. For more texture, I covered both canvases with a layer of Crackle Paint. Once dry, I applied Distress Ink (watered down) and allowed the ink to seep into the cracks. I added a bit of stamping, using the Dictionary Page stamp. This added more texture and interest. 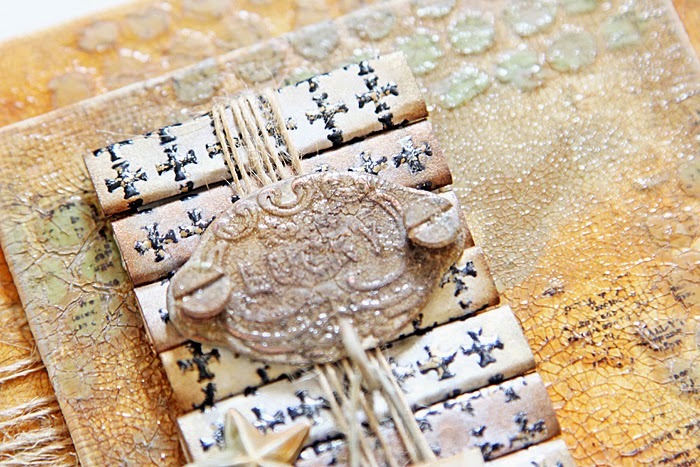 To create my focal point, I heat embossed a sheet of heavy cardstock, using the Design Crosses 2x2 stamp. 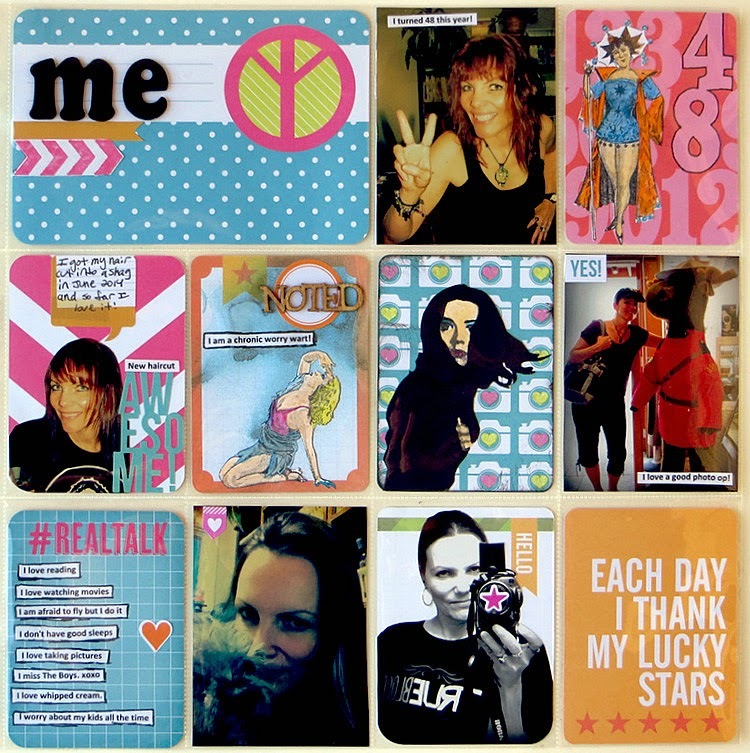 I then painted each square with Shimmerz Inklingz, cut each stamped image out, then rolled each square into a flat piece. 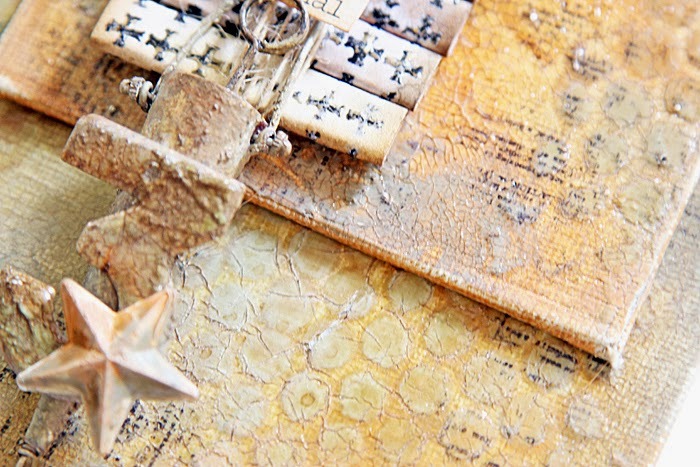 I glued each rolled square to a scrap piece of cardboard, and wrapped twine around the entire piece. To finish my canvas, I added several metal embellishments, painted and enhanced to match the colors of the canvas. How do you create texture on canvases? Please share your tips and ideas! I am always looking for new ways to create! step 1: measure the can and cut a piece of cardstock at size. 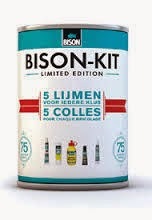 Spray some bistre on the cardstock and delute with water. 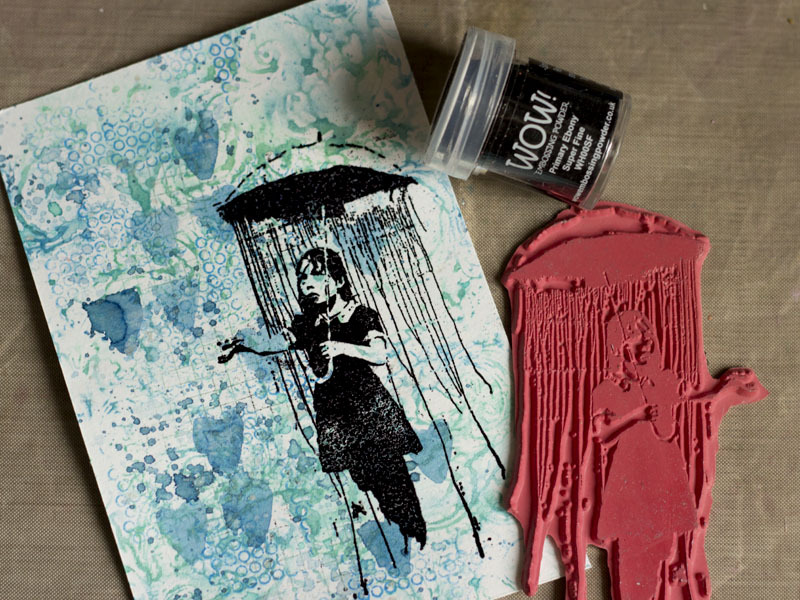 Take a stencil and sponge with gesso. 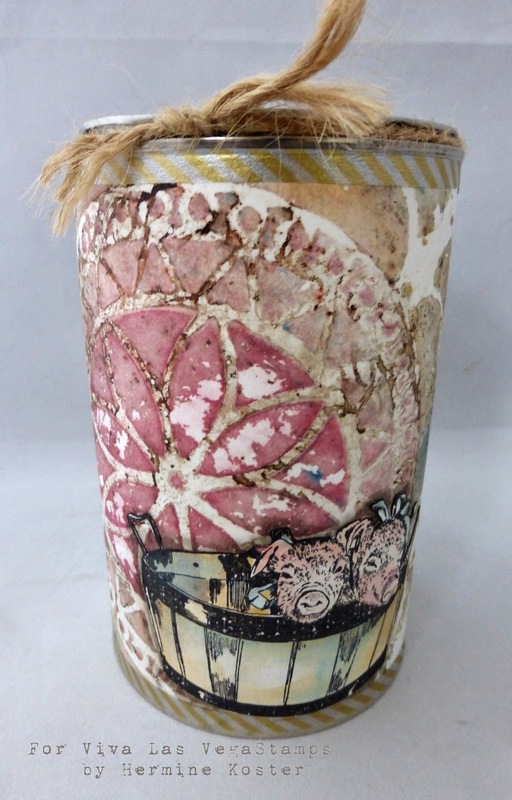 Beause bistre delutes in water it also reacts with the wet gesso, which gives these gorgeous muted grungy colours. Distress it with a paper kitchen towel so it looks even more grunge. 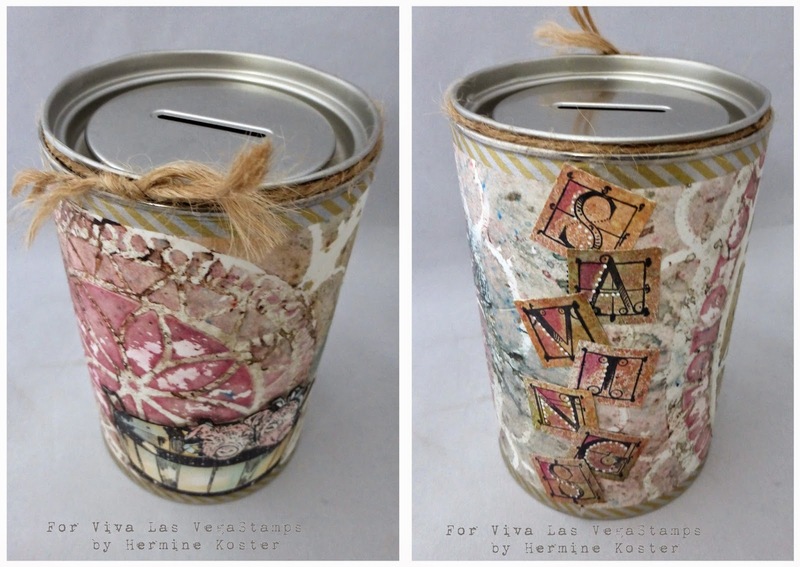 step 2: glue the cardstock around the can with miracle tape and finish it off with some washi tape. Put aside for a little. step 3: stamp with Stazon Black the letters "savings" from the steampunk alphabet 5888 on a piece of cardstock and spray with some bistre mixed with water in a spray bottle. Punch out with an inchie punch. Give them some highlights with a Sharpie white. step 4: stamp with Stazon black the pigs in basket large 9686 on a piece of cardstock, colour in with Lyra crayons and a waterbrush, using the same colours as used in the background and cut out. step 5: Glue the letters on the back where the ends meet from top to bottom. Glue the pigs in basket at the front and make some shading around it with Lyra crayons and a waterbrush. step 6: finish it off with a piece of string. Hello everyone! It's Amber here again today! Yeah! I'm super excited to be able to share another two projects with you VLVS fans. 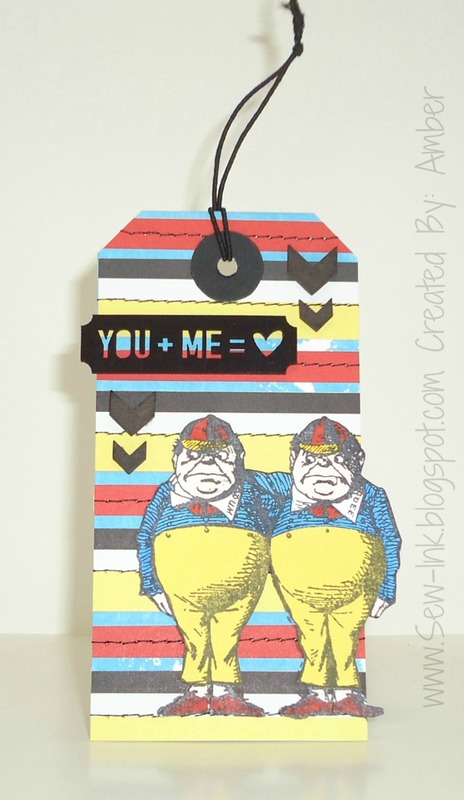 Today I have not one but two fun little tags to share. 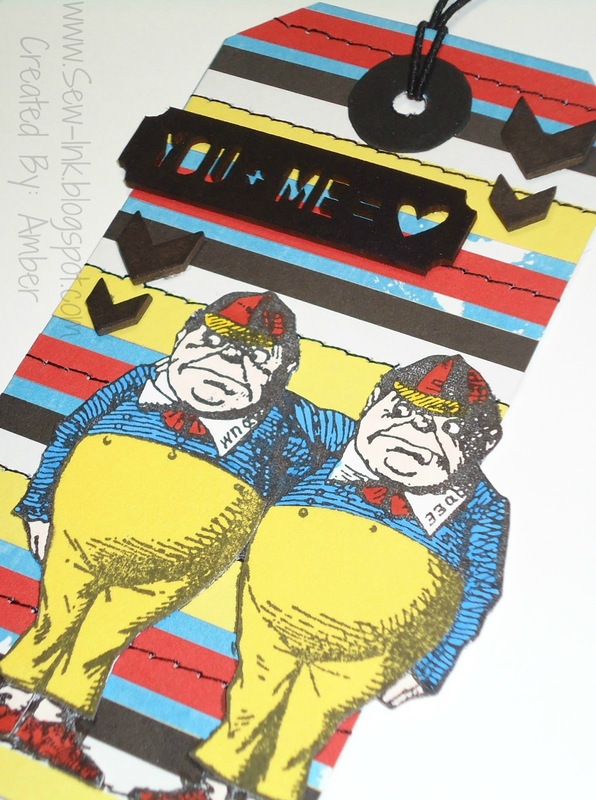 To create my first tag, I started by stamping TweedleDum & TweedleDee onto some white and yellow cardstock. I colored them with some colorful markers, cut them out, and then paper pieced their pants with the yellow cardstock. For the base of my tag I started with some blue patterned paper and then stitched some colorful strips of striped paper horizontally across the blue tag base. To finish, I attached a wood veneer sentiment and a few chevron confetti pieces that I colored in black to the upper half of my tag. Check out the close up below! 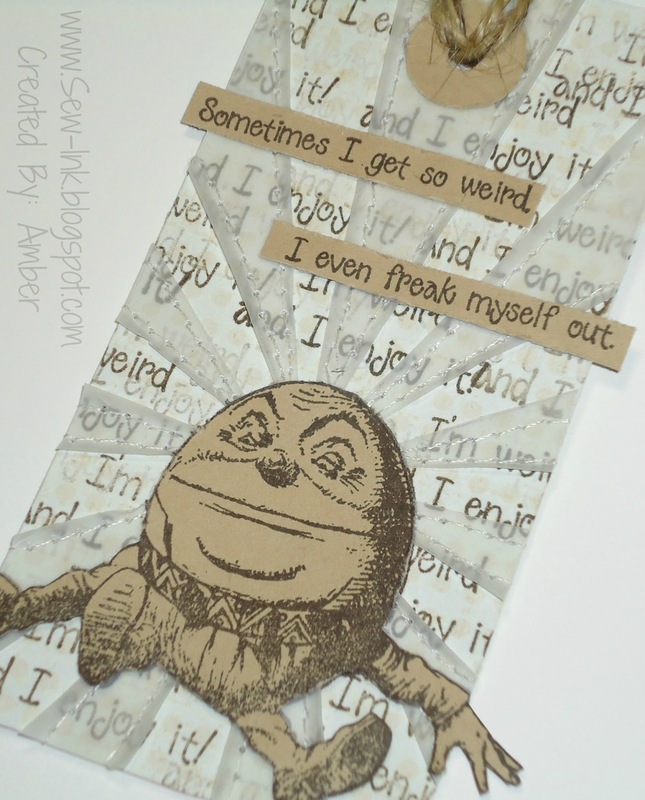 To created my second tag, I started by stamping Humpty Dumpty and the "Sometimes I Get So Weird I Eben Freak Myself Out" sentiment onto some kraft cardstock. After I had the cut out I set them aside and started working on the tag base. I started by cutting my tag out of some lightly polka dotted paper and then I randomly stamped the "I'm Weird And I Enjoy" sentiment all across the tag base. After I had my background stamped I cut and stitched a few vellum sun rays all around my tag base. 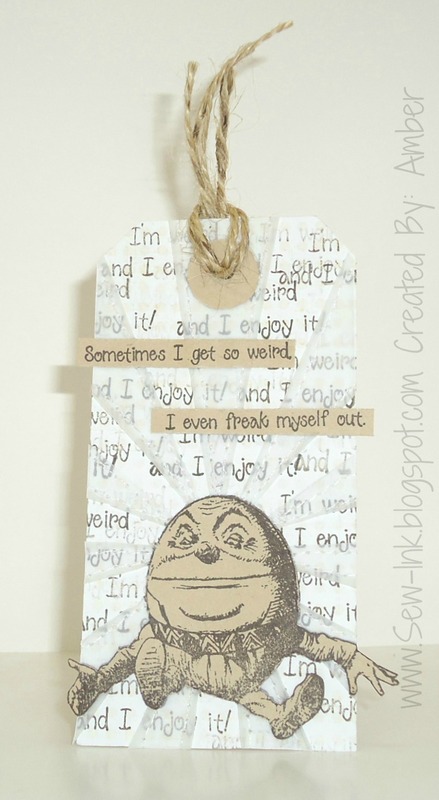 To finish, I added my humpty dumpty image,sentiment, and twine.You can check out a close up below! 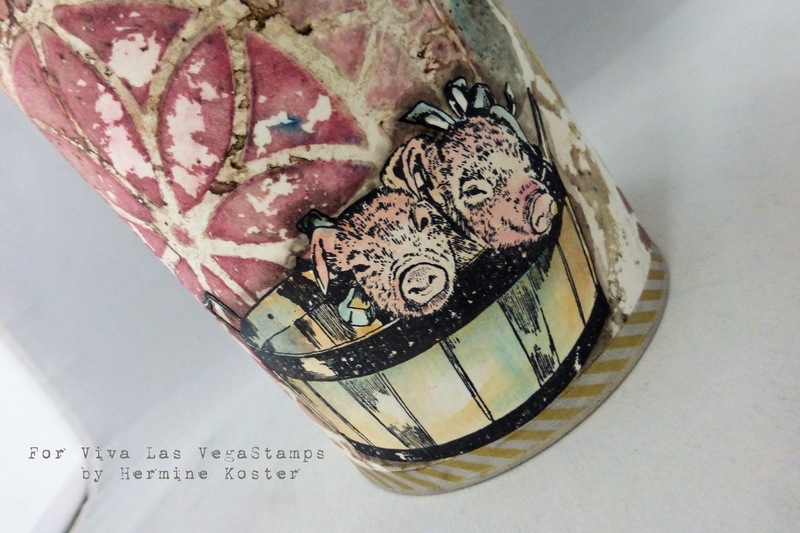 Before I go I want to say a special Thank You to DeeDee for inviting me to be a guest designer for Viva Las VegaStamps. I had lots of fun creating and sharing my projects here on the blog and Thanks to each and everyone of you that have let me a kind comment! Hello everyone! 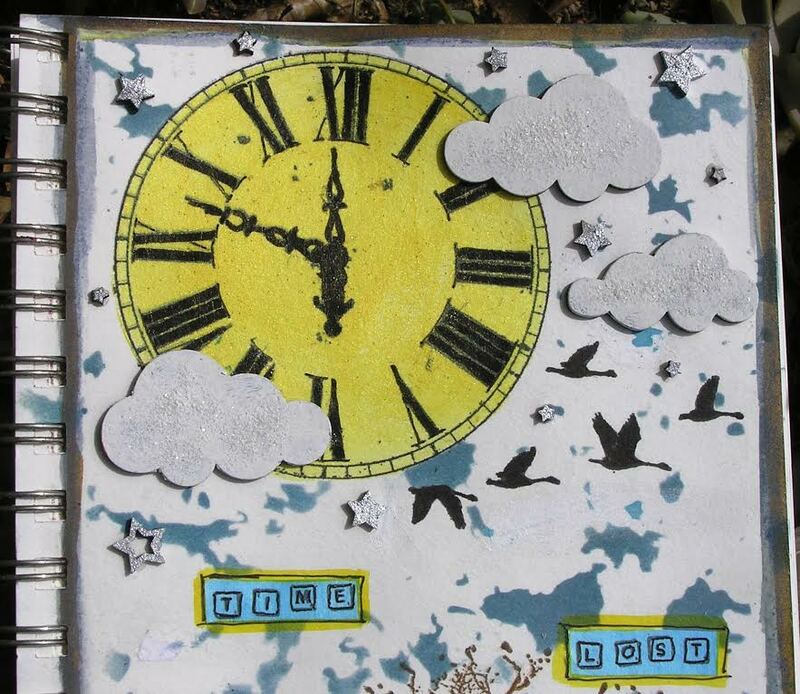 Marilyn back with you today with a journal page I created. I fell in love with one of the recent plate releases (Plate 1444) and just had to use the stamps. 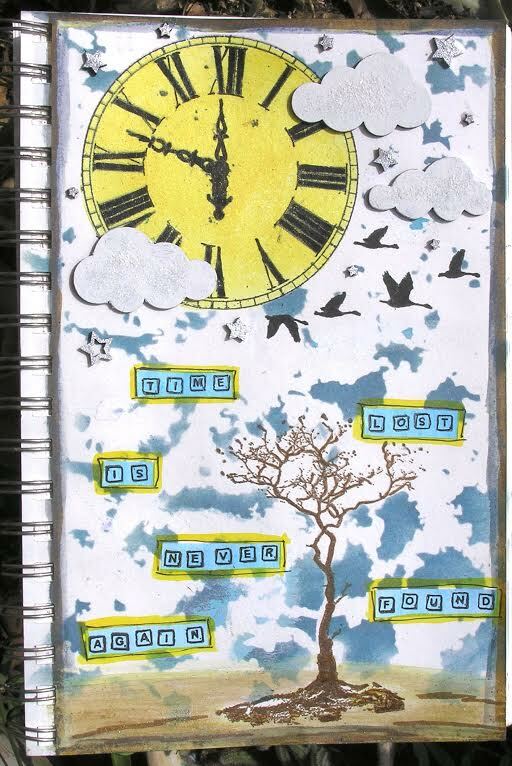 To start off my journal page, I stamped the Clockface and Flock of Geese with black Archival ink directly onto the white page. I then masked them off and since I was going for a cloudy, moonlit night-type of background, stenciled over them using a Crackle stencil with Broken China Distress Ink. Next I painted the Clockface with Lemon Tart Velvet (I wanted a glowing effect) and then traced each Roman numeral, the clock hands, and the geese with a Micron pen to make them darker and to help them stand out. I then painted the clouds with Picket Fence Distress Paint and the starts with Brushed Pewter Distress Paint and adhered them to the page. It's hard to see in the picture put while the paint on the clouds was still wet, I sprinkled on dry glitter (okay, I'm a glitter fiend & most of my projects have glitter on them). 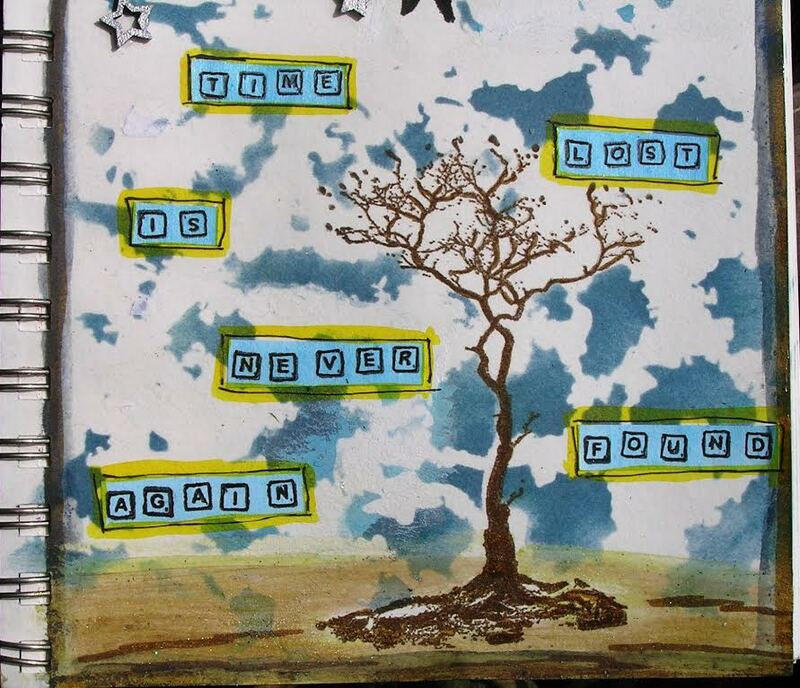 At the bottom of the page I stamped the Weathered Tree in dark brown ink and then using a brown marker, added some scribbles to "ground it" to the page (it looked like it was floating in space). I then painted on Kona and Basil Velvets to give the impression of dirt and to add a horizon line. The quote is one I found in a book of quotes that really resonated with the stamps I had chosen. I used the small Scrabble ​Alphabet letters to stamp the saying onto white cardstock which I colored with the a Fiji Velvet and then outlined using my Micron pen followed by a yellow marker. Finally I added a line around the entire page in black and brown marker to give it a frame. I've had a blast being a Guest Designer for VLVS! and want to thank DeeDee for giving me such an awesome opportunity! Greetings stampers! 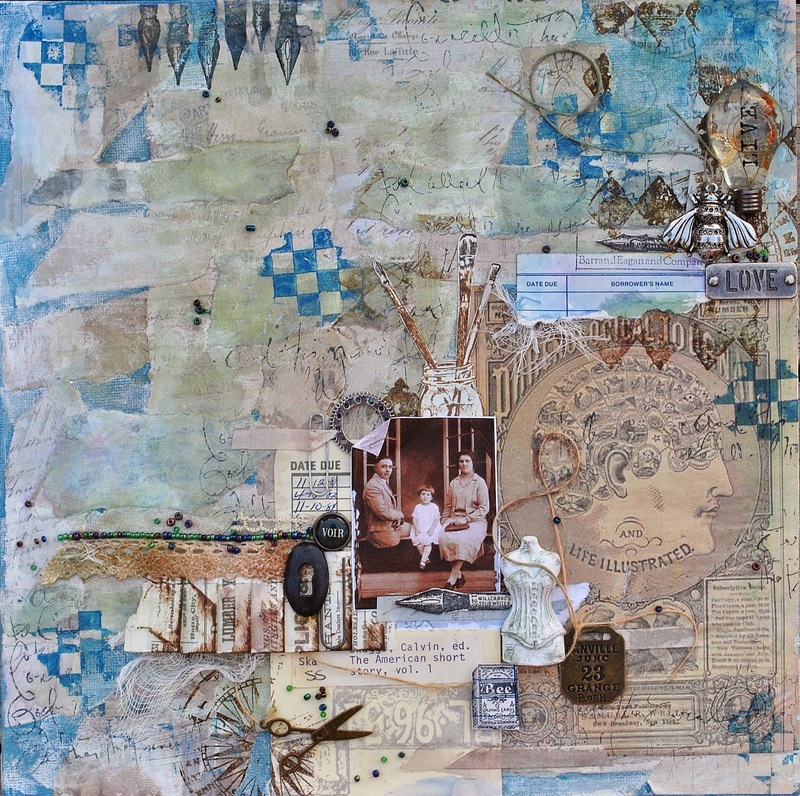 It's Amy blogging today, to share a vintage style collaged canvas. 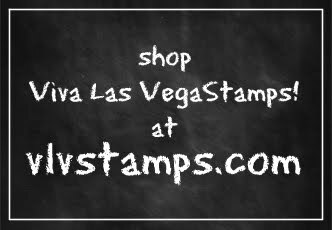 I have 7 different Viva Las VegaStamps! on this canvas, and I think they all work so well together. I started by prepping a 12x12 canvas board with...of all things, a sample of Benjamin Moore blue paint I picked up at the hardware store for $1. 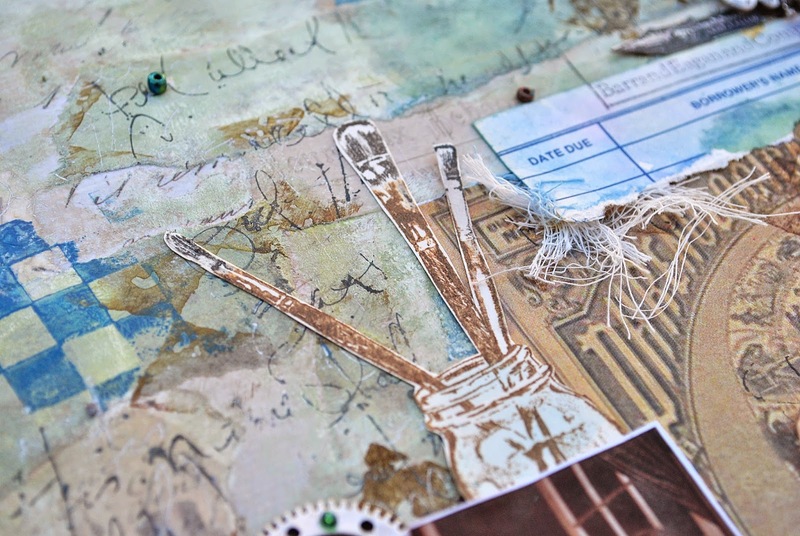 I then layered on vintage style papers, layering them on with Mod Podge. When this had dried, I added layers of mists in light browns, and spread them on with a brayer. A layer of white acrylic paint was the final of the canvas layers. The fourth layer on this canvas is the background stamping, where I used the checkerboard and cursive writing stamps randomly all over. I kept the harlequin diamond stamping just over the area where my photo cluster would be. After layering on vintage papers and elements, I stamped the Bee Cards, Paintbrushes in Jar, and Pen Tips onto untextured cardstock, and fussy cut them out. 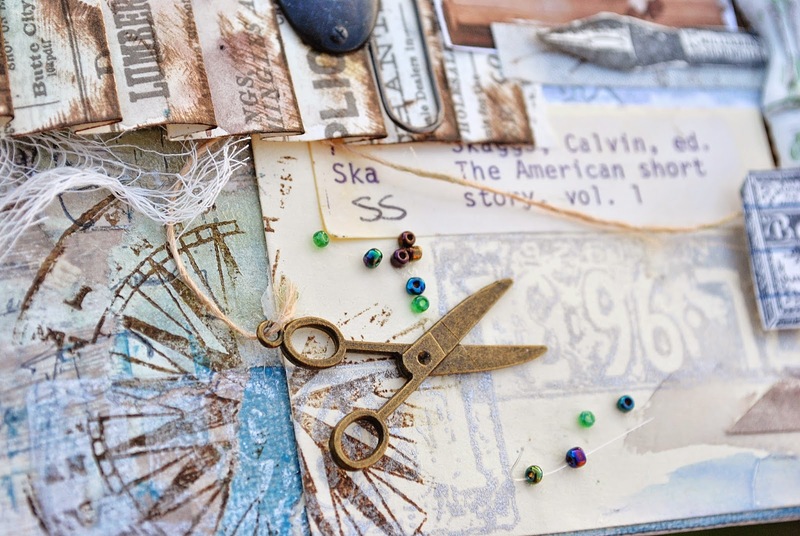 Adding them throughout the clustered area of the collage, gave the perfect unique vintage touch. The Directional Wheel stamp added a perfect bit of movement on the bottom and top corners of my layered cluster. I love the look and how it blends seamlessly with the style of the piece. Backgrounds: checkerboard, cursive writing, Harlequin Diamond. Other: Bee Cards, Paint Brushes in Jar, Pen Tips, Directional Wheel. Hi!! Karen here with you again today! I absolutely adore this stamp, and have been waiting patiently for it to arrive. I then stamped the Girl in Princess costume onto some blank pages of an old book, and cut her out.. isn't she just adorable. I also added in some fussy cut butterfly wings.. turning her into a fairy princess!! and my tag was finished! 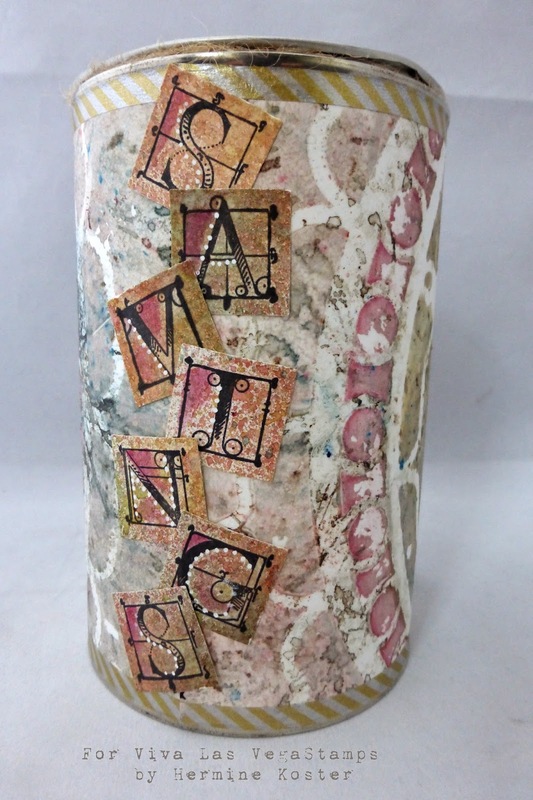 Mail Art Mania is back!